We talk a lot about designing your own work. Work around your values, needs and abilities. 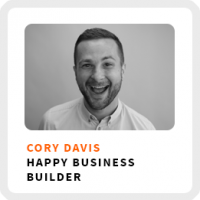 Cory Davis, wants to help you do what you really want to do for work by showing you how to build a happy business, instead of what’s just gonna make you a good buck! He’s a multipotentialite, meaning he has lots of interests he works on simultaneously. He manages three businesses, a supplement coaching business, marketing consultant for natural product brands and he recently started another business helping solopreneurs build happier businesses. How a life crisis helped Cory realize it was time to let go of the “unhappy” business he built for himself and find a way to build a “happy” business. Why your loved ones and those closest around you might not always be the best compass for building your business. How developing faith in his habits led to Cory’s current success. Wake up time: 6:00am or so, doesn’t set an alarm. Core work activities + habits: 1) Directing business channels using Facebook ads. 2) Not letting social media be the boss, but still creating content. 3) Meditating. Ideal work environment: In a community, engaging with others. How he likes to learn: Learning by doing and from video courses. Regains focus by: Meditating again, getting out of his head and back into his body. 90-day goal: Give away 20 Squarespace sites. Watching the watcher. Removing yourself from your thoughts and conceiving of them as things that happen to and through you. Cory is generously giving away 5 free SquareSpace websites to LSTM listeners! Apply for a free Squarespace website at EcstacticBusiness. He’s also offering a 33% discount off his supplement coaching call at SupplementsCoach. Email Cory at cory@supplementscoach.com with any questions!